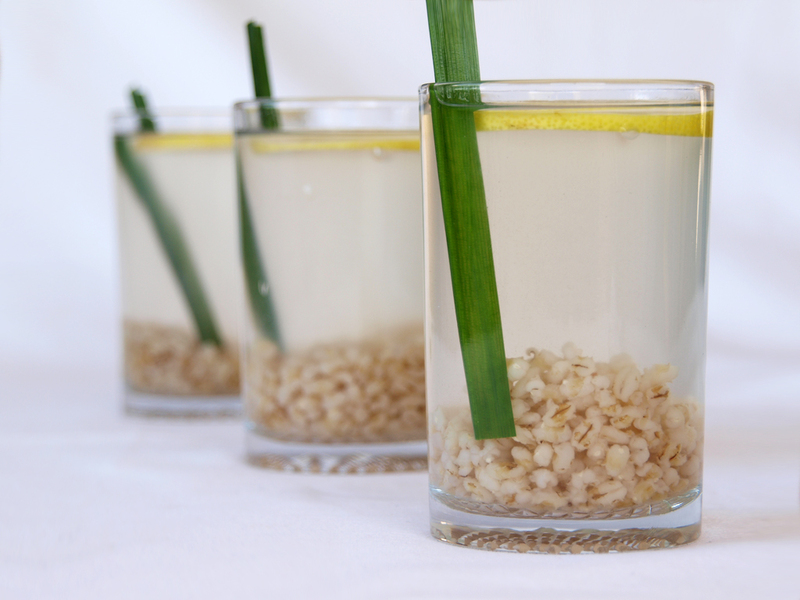 Barley Drink or Barley water is a beverage made out of boiled barley flavoured with lemon and sugar. A traditional British soft drink which is commonly home-made and also commercially available with different flavours to choose from. This practice of boiling grain in water has been existing since the ancient times and that was evident with this recipe. Initially called as Kykeon, it was consumed to break sacred fast during the Eleusinian Mysteries. Another drink similar to this one called Atholl Brose made out of oatmeal and honey also existed during the early days. For this recipe we will be adding some Asian twist and this is how they do it in Malaysia, with an added twist of pandan /screwpine leaves and candied wintermelon. In a pot add barley, pandan leaves and water. Bring it to a boil and simmer for 30 minutes or until barley is soft. Add sugar and candied wintermelon, simmer for 15 more minutes. Discard pandan and candied wintermelon then serve with slice of lemon, enjoy cold, warm or hot. I love the lemon and barley we can get in NZ but it’s not available here in the Netherlands. It never occurred to me that I might be able to make it myself at home. that looks so refreshing – and healthy too! lovely. Very interesting! I have not seen this before… Beautiful photograph! This is just fascinating! My doctor revommended something very similar for my dry skin. Your version sounds much more appetizing. I think I’ll give it a shot! How interesting! I guess it’s not so far from Mexican horchata, but looks so exotic. It is so interesting- what does it taste like? it looks so healthy and refreshing… a glass of this is what i need. STL has been under the wrath of a scorching sun.. yep it’s way too hot here … will love a glass of barley drink! I’ve never seen any drink like this! It looks delicious in your picture and sounds very, very interesting! One of those drinks I just have to try out of curiosity. Thanks for sharing this. It’s totally new to me! I drink barley tea (we call it Mugi Cha) everyday because it has no caffeine. I would love to try this one. Oooh pandanus! Even though we used to eat lots of cooked barley at home, I’ve never actually heard of drinking the water! Gorgeous shot! Never heard of this drink before but I’m totally giving it a try. That drink is totally new to me and I am really curious about it. I need to get soem barley and to give this a try really soon. I’ve only tried Korean barley tea. This sounds very interesting–and what beautiful styling!